The Discovery astronauts flew to the Kennedy Space Center today to review emergency procedures and participate in a practice countdown Wednesday, a major milestone on the road to launch Feb. 12 on a space station assembly mission. Talking to reporters at the Shuttle Landing Facility, commander Lee Archambault said the astronauts will be too busy with training Tuesday to watch the inauguration of President-elect Barack Obama. Asked what he might say to the new president if he had the opportunity, Archambault said "I would like to at least encourage him to keep the course that we're going on." "We're on a pretty nice course right now, we know we're going to develop a new vehicle, we've got the Constellation program well underway and we're anxious to fly in 2014 or 2015," he said, referring to the new Ares 1 rocket and the Orion crew capsule NASA plans to build as a replacement for the space shuttle. "Hopefully, we can stay on track with that," Archambault said. "But the long-term goal of getting back to the moon and ultimately beyond and to Mars, I think, is really the future of the program. So we'd love very much for him to stay the course and press on with the Constellation program." In the five-year gap between the planned retirement of the shuttle in 2010 and the debut of Ares/Orion in late 2014 or 2015, NASA astronauts will be forced to hitch rides to and from the international space station aboard Russian Soyuz spacecraft. NASA's long-range plan - the Constellation program - calls for launching astronauts to the space station aboard Ares 1/Orion starting around 2015 and eventually on to the moon using the Orion capsule and a new heavy-lift rocket called the Ares 5. During the presidential campaign, Obama expressed support for adding at least one additional shuttle flight and accelerating development of the Ares 1/Orion to help shorten the gap between the end of shuttle operations and the debut of the new system. But it is not yet clear what actual changes might be on tap for NASA. The incoming administration did not ask NASA Administrator Mike Griffin, the architect of the Bush administration's Constellation program, to stay on the job and a replacement has not yet been named. Whether Obama will accelerate the Constellation program or perhaps order a change of course for NASA is not yet known. 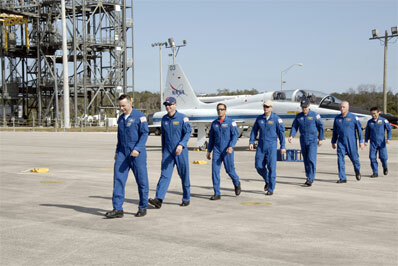 Archambault and his crewmates - pilot Dominic "Tony" Antonelli, John Phillips, Steven Swanson, Richard Arnold, Joseph Acaba and Koichi Wakata, a Japanese astronaut who will replace Sandra Magnus aboard the space station - are scheduled for launch on the 125th shuttle mission at 7:32 a.m. on Feb. 12. The primary goals of the mission are to deliver and install a final set of solar arrays on the right side of the station's main power truss; to deliver Wakata and bring Magnus back to Earth after three months in space; and to complete a variety of "get-ahead" tasks needed for future assembly missions. The astronauts also plan to deliver a new component for the station's urine recycling system, a critical element in NASA's plan to boost station crew size from three to six in May. The recycling system was installed during a shuttle flight in November, but the crew has had problems with a distillation assembly. NASA plans to begin six-person operations in May regardless, but the recycling gear must be activated and thoroughly tested as soon as possible to avoid potential problems downstream. As for Discovery, Launch Director Mike Leinbach said today there were no major technical issues at the pad and that the shuttle was in good shape for launch.